One of the reasons that Barcelona is such a huge tourist attraction is that it offers the opportunity to enjoy a city break, with all you’d expect, sightseeing, culture, shopping an that. 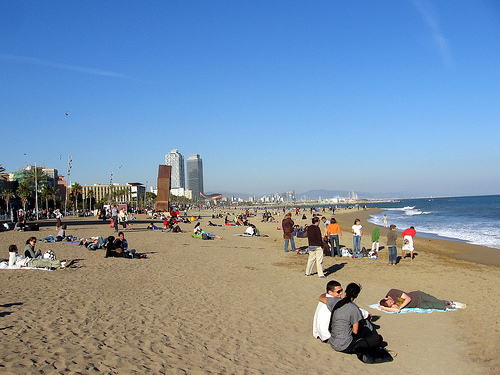 But in Barcelona you can also experience the beach life, sunstroke, after sun lotion and falling asleep, pished, on the sand. 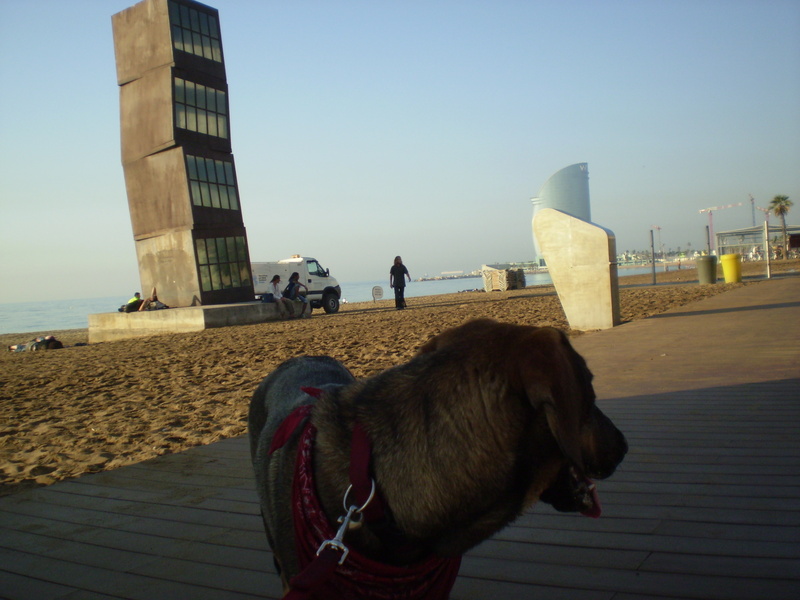 Only fifteen minutes walk from the Ramblas you’ll find yourself on Barceloneta beach, although the beaches extend maybe 3 or 4 miles south, realistically, if you are here for a couple of days you’ll end up on this one. You’ll find it busy, colourful (mainly sunburn pink in fairness) and there will be enough stag and hen weekends to give you a real Spanish holiday resort experience. When I first moved here my first job was on this very beach, using the bar premises of the Legendary Luis and his family and the scrummy cava from the Champaneria the wife and I spent 3 months walking up and down the beach selling cava and strawberries for a whopping 10 euro. Best job I’ve ever had, even the ever present risk of getting lifted was worth it. I also had some cracking fun with the tourists on the beach, my favourite ploy was spotting the couples on a romantic city break. “Surely you love her enough to spend 10 euro on a bottle of bubbles and strawberries?”. What followed was an icy stare from her that would chill a freshly made cup of tea and a look from him that screamed “I want to rip your throat out you utter bastirt”. What this job also told me is that the beach at Barceloneta has some fairly well-defined “zones”. Looking left to right from here the zones are as follows, Mental brit tourists, stoned oot their gourd, yoghurt knitting, hippy types, surly and haughty Catalans, merr mental brit tourists, boaby and flaps oot nudie, gay and bringing up the rear, gay nudie. So, as you see, there is something for everyone (except the Welsh, no animals allowed on the beach, sadly). If you are here for a few days here is my top tip. although the beach is well served with nearby shops, guys selling stuff and beach bars, these, especially the latter, can be expensive. When you arrive find a supermarket or one of the Chinese “fancy goods” stores and invest in a cool box. You’ll pick one up for maybe 15 euro. Once you’ve got that get along to the supermarket and fill yer box with whatever takes your fancy, beer, wine, cava or, my particular favourite, rum. Add a bag of ice and bevvy-wise you are good to go. I also strongly recommend buying a load of cold meats, olives an that to keep you going during the day. You can stock up for a grand day out for 15 euro, the price of two rounds of drinks in the beach bars. 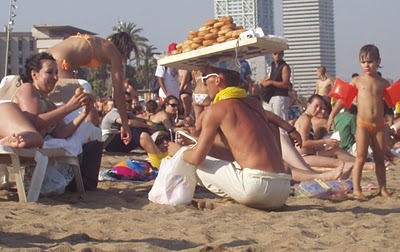 Barceloneta beach is an experience, loud, a bit mental and, at the weekend, very crowded. If you are into that kind of experience, then fill your boots. For the more sedate visitors I’ll be g¡ving some ideas for a quieter beach experience in a forthcoming entry.